The spouse filing for divorce (Plaintiff) must be a resident of South Dakota, or be stationed in South Dakota while a member of the armed services, at the time the divorce is filed. A no-fault divorce can be obtained in South Dakota if the spouses have irreconcilable differences. You file a Summons and Complaint with the Circuit Court Clerk. You either mail or hand-deliver a copy of the Summons and Complaint to your spouse along with a few other documents for your spouse to sign and return to you. Divorce by Stipulation: The Defendant's Answer and a few additional documents are filed with the Circuit Court Clerk within thirty (30) days of your spouse receiving the Summons and Complaint. The divorce will be finalized in approximately sixty (60) days without a hearing. 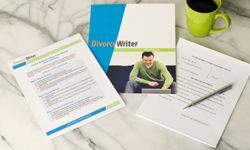 DivorceWriter provides forms specific to the state of South Dakota and offers a money back guarantee if your documents are not accepted by the Court. You have qualified to use DivorceWriter to complete your South Dakota divorce papers online. Select "Continue" to start the interview.